In the aftermath of the Munich Agreement, Poland sends a note to Czechoslovakia, demanding they cede them the land of Teschen. The Western Powers (France and Great Britain) had agreed to Hitler's demands, and had given him the Sudetenland. Having lost the Sudetenland and having been abandoned by the West, the Czechs had no choice but to give in to Poland. The enemy did not expect my great determination. Our enemies are little worms, I saw them at Munich. ...the settlement of the Czechoslovakian problem, which has now been achieved is, in my view, only the prelude to a larger settlement in which all Europe may find peace. This morning I had another talk with the German Chancellor, Herr Hitler, and here is the paper which bears his name upon it as well as mine (waves paper to the crowd - receiving loud cheers and "Hear Hears"). . .
My good friends, for the second time in our history a British Prime Minister has returned from Germany bringing peace with honour. I believe it is peace for our time. We have suffered a total and unmitigated defeat...you will find that in a period of time which may be measured by years, but may be measured by months, Czechoslovakia will be engulfed in the Nazi régime. We are in the presence of a disaster of the first magnitude...we have sustained a defeat without a war, the consequences of which will travel far with us along our road...we have passed an awful milestone in our history, when the whole equilibrium of Europe has been deranged, and that the terrible words have for the time being been pronounced against the Western democracies: "Thou art weighed in the balance and found wanting". And do not suppose that this is the end. This is only the beginning of the reckoning. This is only the first sip, the first foretaste of a bitter cup which will be proffered to us year by year unless by a supreme recovery of moral health and martial vigour, we arise again and take our stand for freedom as in the olden time. Within a year, Poland would face Hitler's Germany. 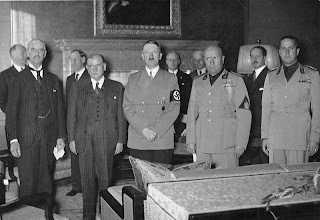 Pictured: Leaders of Britain, France, Germany, and Italy about to sign the Munich Agreement. (CC) Deutsches Bundesarchiv‎. More Information: Munich Agreement, Chronology of the Crisis.